Singapore Changi International is one of the best airports in the world. Despite being a tiny country, Singapore is home to one of the largest international hubs for air travel in southeast Asia, and home to one of the best airlines in the world – Singapore Airlines. Why would such a tiny country need such a huge government supported global airline and such a world class airport? For any place, the airport is the gateway to success. Having a well developed airport allows you to attract more flights and more flights means more tourists and more business travelers. More importantly, businesses looking to set up international outposts are very concerned about the Airport. Not having a good one could mean losing millions or billions in investment or tourism income. Singapore does even more to make their airport a destination through innovative cross promotions, the long standing "Singapore Stopover" – and even the "World's First Airport Butterfly Garden." 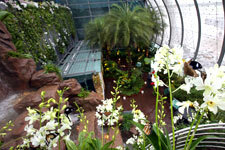 All add to the appeal of Singapore as a destination for work and leisure. So why do so few cities focus on building a world class airport? Obviously, it's expensive – but usually it's because the link between the airport and prosperity is not always immediately obvious. There are other things like roads, climate, culture, education, accommodation and attractions that matter – I'm not saying they don't, but the airport is pivotal. Many things in business are the same way — including social media. The real power of customer conversations, authenticity and everything that social media can bring aren't always obvious. Sometimes it's just easier or more critical in the short term to fix the potholes (figuratively speaking). Eventually, every great company realizes that having a quality product or experience is only half the battle. The other half is having a good gateway (or airport) to get your customers there.